Surrounded by headland, ocean and national park, Burleigh Heads is a protected haven. Home of the famous "Burleigh Barrel" that attracts surfers from around the globe keen to experience this classic point break. 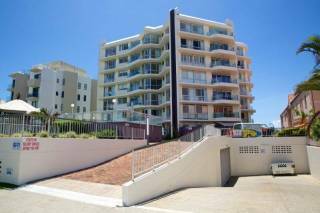 Burleigh Point Apartments are situated on beachfront with the white sands and warm blue waters patrolled 365 days of the year, makes an ideal getaway retreat. 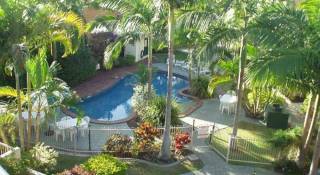 Three and a half star, three storey complex, Burleigh Point apartments are individually furnished, fully self contained and include: Very spacious lounge and dining area's, two bedrooms, two bathrooms, full kitchen and kitchen facilities, private balcony, laundry, direct dial telephones, ceiling fans, all linen provided, secured access and undercover off street secured parking. 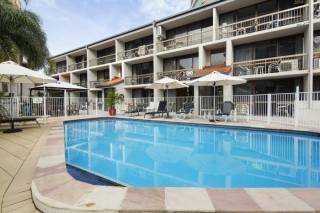 Complex includes pool, heated spa, BBQ area, and is close to major shopping centres, 9 golf courses, theme parks, Coolangatta airport, Jupiters casino, excellent retail shopping and a variety of fantastic restaurants. * Ensure the allocated apartment is returned in the same condition as at time of initial occupation and take full responsibility for the actions of any visitors, including damages caused to apartments or public areas and the rectification of such damages. When you register with us we will require a credit card for security. Where a credit card is not available we will require a $200.00 cash deposit. * Report any damage or breakages immediately. * Keep apartment tidy and presentable at all times. * Not take crockery, utensils and or furniture from one apartment to another. There are no refunds for early departures and charges apply for late checkout which must be aranged prior to arrival. Please make sure you only park in your allocated car space - should you park in the incorrect carpark you may be towed at your expense. Where it is the usual practice for warnings to be given to guests and/or visitors in the first instance, breaches of these conditions may result in immediate eviction and possible criminal charges. Thank you for choosing to stay at Burleigh Point Holiday Apartments, should you have any queries or concerns please feel free to contact reception during office hours. We hope you enjoy your stay!